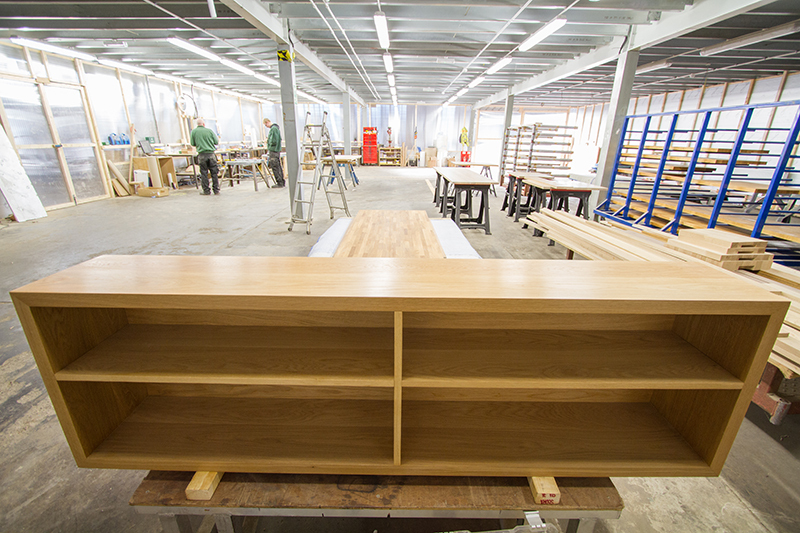 These Oak shelves have just received its nano-coat treatment. Placed in our warm finishing room, the treatment cures, forming a beautiful, natural finish that lasts longer and is easy to maintain. A fantastic addition to your worktop, integrated drainage grooves ensure water drains off into your undermounted sink rather than sitting on the surface of your bespoke worktop. Something a little different! Used for an external door for a customer’s traditional property, this solid Oak door provides a charming entrance that due to a comprehensive oiling, will last a lifetime. Featuring a large sink cut-out, this Oak worktop is being nano-coated to protect the timber from any moisture, even with heavy use. These filing drawer boxes has just received a final sanding. The dovetails show how precisely these drawer boxes have been engineered. We do this to ensure a sturdy and beautiful filing box.